meniscoid lesions(fiborcartilaginous mass develops laterally after inversion ankle sprain causing chronic arterolateral ankle pain. Allows visualization of: transverse ligament, anterior tibiofibular ligament, deep deltoid ligament, deep portion of posterior tibiofibular ligament. 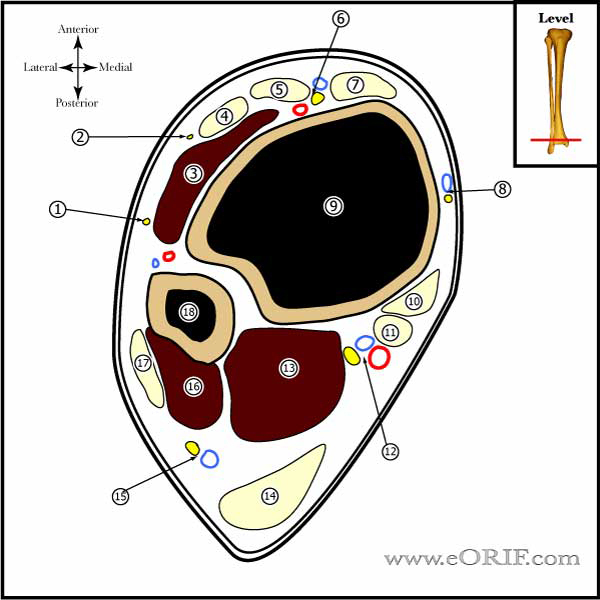 Anterior talofibular ligament is poorly visualized. supine position. All bony prominences well-padded. Posterior 3 from anterior portal: posteroinferior tibiofibular ligament, transverse tibiofibular ligament, capsular reflection of FHL, medial & lateral synovial recesses. Posterior: medial gutter, medial central and lateral talus, talofibular articulation, lateral gutter, posterior gutter. OCD lesions drilled with 0.062mm K-wire at 3mm interval to a depth of @ 10mm. neurologic: most common (primarily superficial branch of peroneal N, saphenous N or sural N. (Ferkel RD, Arthroscopy 1996;12:200). Urguden M, Soyuncu Y, Ozdemir H, Sekban H, Akyildiz FF, Aydin AT. Arthroscopic treatment of anterolateral soft tissue impingement of the ankle: evaluation of factors affecting outcome. Arthroscopy. 2005 Mar;21(3):317-22. Ferkel RD, Small HN, Gittins JE. Complications in foot and ankle arthroscopy. Clin Orthop Relat Res. 2001 Oct;(391):89-104. Barber FA, Click J, Britt BT. Complications of ankle arthroscopy. Foot Ankle. 1990 Apr;10(5):263-6.